Rand McNally and Company. 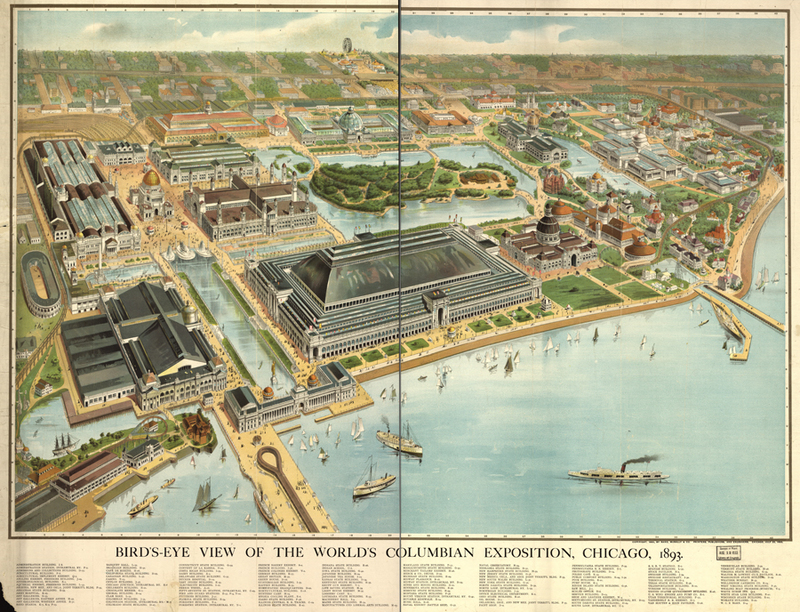 “Bird’s eye view of the World’s Columbian Exposition, Chicago.” 1893. Library of Congress Geography and Map Division. Which U.S. states had buildings at the 1893 World’s Columbian Exposition in Chicago? Label them with their state abbreviations on the map. Describe 10 objects you see on the map; on another page, note the location of each object (hint: use the map coordinates). Pass your object description list to someone and challenge that friend to locate all 10 objects. Compare and contrast this map with photographs of the 1893 World’s Columbian Exposition in Chicago. Do you think the cartographer made an accurate map? Use specific details from the primary sources to support your conclusion. For related resources, see Today in History: Daniel Burnham.